Flyway makes database versioning almost trivially easy. You can put migration scripts in a directory of choice and the database will be magically migrated for you. Source code versioning is a subject that has been widely discussed and which has many solutions created to address it, like Git, Subversion, and Mercurial. But what about our data and the schema that represents it? How do they keep in sync with the application that manipulates it? In this article, we are going to learn about Flyway, a solution that helps developers to handle version control of database schemas and data on Java applications. Flyway is a tool, developed by Boxfuse, that enables developers to apply version control practices to the database that supports a Java application. With it, we can tightly integrate plain SQL scripts in the lifecycle of an application, guaranteeing that its database will always be compatible without manual intervention. Flyway works by checking the current version of the database and by applying new migrations automatically before the rest of the application starts. Whenever a developer needs to change the schema of a database or to issue some changes to the data residing on it, they need to create a SQL script following a name convention in the directory read by Flyway. Usually, this directory is classpath:db/migration, but one can change the default value if needed. Version: Dots or underscores separated in as many parts as one likes. Separator: Defaults to __ (two underscores) and separates the version from the description. Description: A text with words separated by underscores or spaces. Then when a developer adds a second script, naming it as something like V2__another_script.sql, Flyway is able to query the schema_version table to see on what version the database is and can figure it out what scripts it needs to run. Most of the default properties used by Flyway to control the version of the database can be changed. If needed, developers can change the name of the table that Flyway uses, whether migrations can be run out of order or not, where these scripts are, and etc. Take a look at Flyway's documentation for more. How Can We Integrate Flyway? Flyway easily integrates with most of the build tools available on the Java environment. Out of the box, Boxfuse made available plugins to Maven, Gradle, Ant and SBT. But, even if we don't use one of—or don't want to integrate with—these build tools, we can still use Flyway through a CLI tool, or directly through its API. Besides these options, a few plugins were crafted by the developers community. These plugins make smooth the usage of Flyway with some popular frameworks like Spring Boot, Grails and Play. In the next section, we will see Flyway in action with Spring Boot. To better understand how Flyway and other solutions that handle version control of databases can help us, let's do a practical exercise. We will start with an empty Spring Boot application where we will first add a Customer entity with contact details (contact name, email address and phone) directly on it. We will use Flyway to create the database schema (a single table) with some data. We will also create one RESTful endpoint that will be used to retrieve all the persisted customers. After creating this first version of our application, we then will refactor it to extract contact details to an entity of its own, Contact. This new entity will make it possible to add more than one contact to a Customer. In this process, we will use Flyway again to create the second table, contact, and to migrate the preexisting customers' contacts. First of all, let's fork and clone the GitHub repo that contains an empty Spring Boot application. This application is based on Maven, which makes possible to import it in any Maven compatible IDE. So far, only two dependencies were added to it: spring-boot-starter-web and spring-boot-starter-data-jpa. Running the application is just a matter of issuing mvn spring-boot:run in the root directory of it, or through our IDE. But it won't do much for the time being as we didn't add the Customer entity, nor the RESTful endpoint. If you are not familiar with Spring Data, you might think that this interface isn't much of a help. But that is not true; this interface does a lot, actually. It enables us to findAll() customers, save() customers, and findOne() customer by its ID. It also gives us a nice feature called Query Methods, which allows us to create queries simply by defining an empty method declaration. For example, we could create a query to find Customers by their names by adding a single-line method declaration like List<Customer> findByName(String name);. Take a look at the JpaRepository reference for more. As we can see, this CustomerController class uses CustomerRepository, which is automatically injected, to expose customers. With this class, we can now respond to HTTP GET requests with an array of persisted customers. But the problem is that we don't have anything persisted yet and, actually, we don't even have the customer table on our database. Let's use Flyway to create the table and populate it. If we start our application now, Flyway will identify that this script is unapplied and will execute it. This process happens before Spring Boot gets a chance to bootstrap the application. This is important to guarantee that our database will have the customer table available; otherwise, we would face an error when issuing GET requests to the endpoint created. As our application was properly configured, and Flyway got a chance to run the script, we can now issue GET requests to /customers/ without a problem. 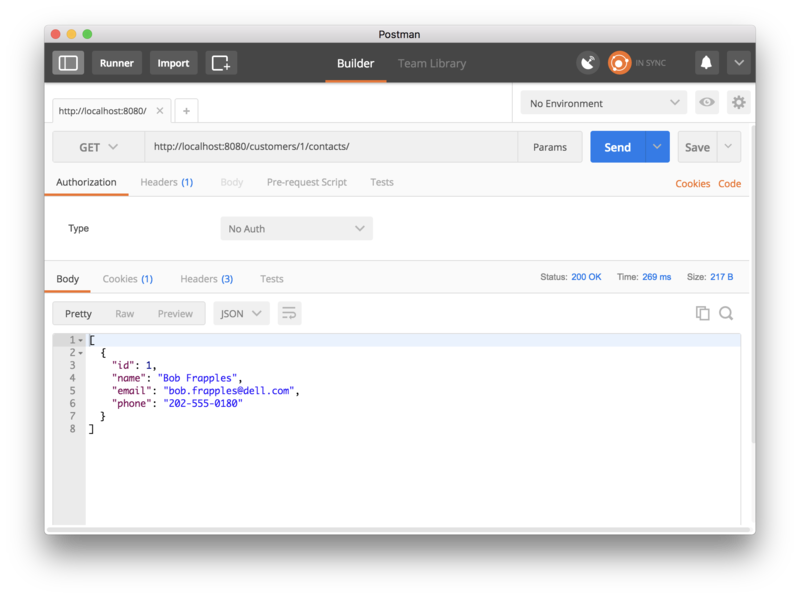 The following screenshot shows the result of a GET request issued using Postman—which is a great tool to use when developing RESTful endpoints. As we can see, the /customers/ endpoint responded properly with the array of customers created in our first script. Let's say that the Product Owner of our team has spoken to the users of the application and that they were complaining about not being able to save more than one contact per customer. What can we do to help these users? Well, the first thing we can do is refactor the Customer entity, extracting the contact fields to an entity of its own. This will require us to use JPA to tie both entities, mapping many contacts to one customer, which is accomplished through the @ManyToOne annotation. Lastly, this will require us to create another endpoint to permit the front-end application to retrieve an array of contacts of a specific customer. The refactoring stated above refers only to the source code of our application. Accomplishing all these changes won't be enough as the database will still contain a single table, customer, with contact details embedded. To fix this issue, we will create another Flyway script, which will contain a command to create the contact table and another command to move customers' contact details to this new table. The only property on Customer that refers to contacts now is a List of contacts annotated with @JsonIgnore and @OneToMany. The first annotation keeps the existing endpoint, /customers/, from serializing contacts of customers, which could be expensive as there are no limits to the number of contacts on a customer. The second annotation, @OneToMany, indicates to JPA that can exist One customer To Many contacts. Note that to retrieve the contacts of a customer, the request issuer will have to append the customer ID to the URL of the endpoint. That is, to get the contacts of Coca-Cola, the front-end application has to issue a GET request to /customers/1/contacts/. But not before refactoring the database. It has to create the contact table. It has to insert the customers' contact details in this new table. It has to drop the contact details columns from the customer table. This is everything we need to do to refactor our database, and it is enough to make it compatible with the refactored source code. Running the application now will make Flyway identify the new script available, V2__contacts.sql, and run it before Spring Boot, making everything work together smoothly. Making these small changes would give us a high level of security alongside with a very extensible authentication solution. With Auth0, we could easily integrate our authentication mechanism with different social identity providers — like Facebook, Google, Twitter, GitHub, etc. — and also with enterprise solutions like Active Directory and SAML. Besides that, adding Multifactor Authentication to the application would become a piece of cake. Having a tool like Flyway integrated into our application is a great addition. With it, we can create scripts that will refactor the database to a state that is compatible with the source code, and we can move data around to guarantee that it will reside in the correct tables. Flyway will also be helpful if we eventually run into an issue where we need to recover the database from a backup. In a case like that, we can rest assured that Flyway will correctly identify if the combination of the source code version and the database version that we are running have any scripts that need to be applied.